Millions of us use Gmail everyday at work. But there are some simple hidden features that can make our lives so much easier. And when we spend many hours every week inside Gmail, small efficiencies can become big ones – not just winning back time but saving us stress and even safeguarding our reputation. But we don’t have time to discover all the hidden features of Gmail by ourselves. 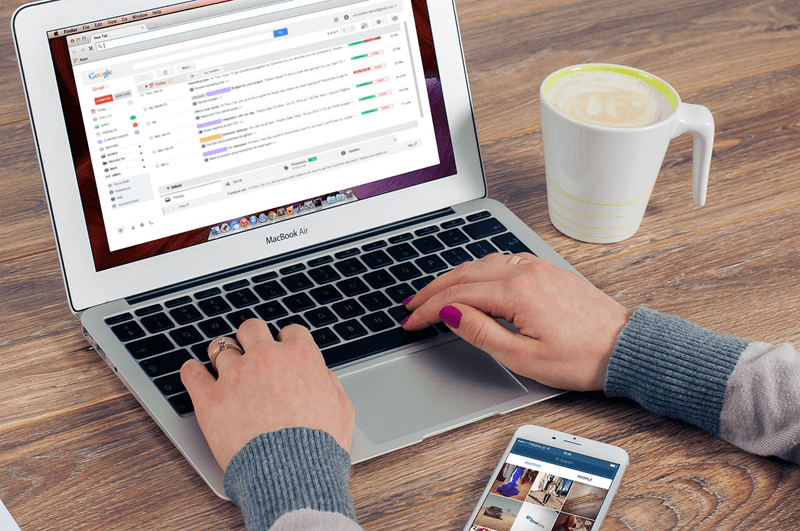 So here are 7 of the best Gmail hacks that are there waiting for you to start using. Do yourself a favor and have a look to see if any could help! 1. Focus on certain areas of work by using Gmail’s advanced search. We all find email overwhelming at points. But that is largely due to the information density an email client gives you. There’s always a pile of important emails waiting for you and you can see them all at the same time in your inbox. Cut out the stress and focus in on specific customers, clients or jobs by using Gmail’s search to create an on the fly focus list. Just click the dropdown arrow on the right of the search bar and put in your keywords or the email addresses you want top focus on. For greater flexibility start learning Gmail’s search terms so you can type in your queries to the search bar. 2. Free yourself from checking your inbox by enabling desktop notifications. Desktop notifications are a love hate affair. You either hate them interrupting your work, or you find them very useful for keeping track of what comes into your inbox during the day at a glance, without having to go to your inbox all the time and actually check for anything urgent. Either way, Gmail does have desktop notifications and you can just turn them on in the General Settings menu. And don’t work about being notified of every promotion and forum update also – you can filter them out so you receive only important email notifications. Pro-tip – There’s also a brilliant free Chrome extension called Checker Plus that gives you much richer notifications if you think notifications will help you. The hidden bit? You can use a whole variety of different markers to visually categorise the status of emails by just turning on an option in General settings under the Stars section. Choose 4 stars to start with and just pick the icons you’ll find most useful. You’ll find a whole collection of different markers – ticks to mark things that you’ve finished, exclamation marks to mark urgent email, or a question mark to mark emails where you need to research an answer. Then head back to your inbox and try clicking several times on the star to set the different markers. 4. Navigate quickly to labels you often use by giving them their own color. Adding a splash of color to your labels helps the eye pick them out much faster and also makes your Gmail look a whole lot more cheerful! You can even use the colors to a mean something. Set up some labels that mark the status of an email: Green for an ‘Action’ email where you need to do something, or red/orange for and email you are ‘Waiting On’. Just click the arrow to the right of a label in the Gmail sidebar and change the color. 5. Clean up your inbox by setting up filters to automatically organise emails for you. Filters might seem complicated and laborious to set up, but a little shortcut can help you keep things nicely organised without you lifting a finger. Just click the ‘More’ drop-down inside an email or with an email selected and chose ‘Filter messages like this’. The filter will assume that the sender’s email address is what you want to filter on, but you can change it to suit yourself. Automatically label email’s, keep them out of your inbox or even send an automated reply by enabling canned responses. Pro-tip: If you used rules in Outlook before moving to Gmail, you can import them to Gmail with this opensource tool. 6. Cut out those annoying cc’s from your inbox by muting conversations. Those conversations with colleagues which you are cc’d into and keep re-appearing in your inbox every time someone reply-all’s? 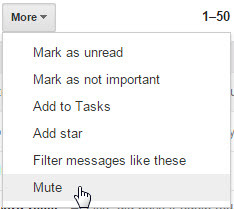 Stop them coming back with Gmail’s mute option. You’ll find it in the ‘More’ drop-down at the top of a conversation. 7. Clean up your sidebar by hiding labels you don’t use. Having lots of labels is essential to keep things organised. But you don’t need access to all of them from your sidebar. Hide old labels from your sidebar and just keep the ones you use. You can always search for a label that’s not in your sidebar by using “label:your-label-name” in the search bar. To hide labels you can either click the drop down next to an individual babel on your sidebar, or if hiding lots of them, go to Gmail settings and click the Labels tab. 8. Access all your other email addresses from one Gmail tab. Have several Gmail accounts or some Outlook and Yahoo accounts as well? You can port them all over to one Gmail screen and manage everything from one place using Gmail’s Multiple Inbox feature. But first, you need to link up your accounts and port them into Gmail. It shouldn’t take more than 10 minutes. Go to the Accounts and Imports tab on Settings. Start by importing you email from other accounts. Then set up Send mail as – so that you can send emails from any of your accounts, all from one Gmail screen. Lastly, set it up to check for new mail y adding your email address information. One word of warning – if you have lots of mail in your other accounts and you are not on a 30GB business Gmail account you might start using up your data allowance alarmingly fast! Lastly turn on Multiple Inboxes in Gmail settings under the ‘Labs’ tab and then chose how you want your inboxes to appear, or whether you just want them to be accessible from the sidebar. And there you have it. Gmail as the heart and soul of all your communications. No more flipping between different email clients. No need for several Gmail tabs open with different accounts. Its all there.